Why Eating Gluten Free foods if your not a coeliac is effecting your pocket and not your gut…..
Gluten is a protein found in many grains, wheat, rye & barley. Its glue like structure makes it easy to use as a glue for combining foods like doughy products such as breads, bagels, cakes ect. So you have decided to start eating healthy and all you can see getting slimmer is your bank account? Have you been a target of all the buzzwords around healthy eating and feeling better? The words like superfoods, cleanse, gluten free, high protein, low carb, paleo, low fat, sugar free. These words are created to make vulnerable people feel they are making great food choices, While also being very overpriced. Now the fact that gluten free foods are made for coeliacs I cant understand why Non-Coeliacs would buy this is it because they feel its better? 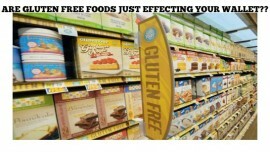 There’s the difference also there’s a huge price difference as unfortunately with the health industry making it fashionable to eat gluten free its became a profitable scale of the health food section. If you go to your local chipper and order a Fresh cod & Chips guess what?? It’s a gluten free meal! But chippers know not to advertise this as people aren’t this stupid to think this is healthy but guess what else…Its ok for a coeliac to eat as it contains no gluten! My tip is if you can eat foods containing the grains that carry gluten and don’t become irritable in your gut, feel tired, excessive wind pains & headaches, which are only a few symptoms. Then drop it out of your diet and look after the pennies, Buy whole foods and take note how you feel after eating specific foods.